I do believe that low set 3rd and 4th fingers indicate a problematic childhood and upbringing, to the point of damaging the psyche of the bearer. The low set fingers only indicate mild cases such as shyness etc.. not a sign of pshycopaths, well not alone as an indicator anyway. Iva Marlat was named the Prison demon, and he had a well formed girdle of Venus, a very broken up short head line, sectioned into three pieces. His thumb tip was slightly boulbous but his index tip was more pointy than rest of fingers. He had a longer tip on mercury finger than the middle and lower part of it and skin was quite coarse looking. Overall at first glance it was the head line which stood out as different. So as you can see there is many indicators that have to come into play, these are just a few that I remember from my study of his hands, unfortunately I lost my notes in a fire so cannot refer to them. Since 'Adolf Hitler' is mentioned in this topic... who became know as the biggest mass killer of the 20th century, I also would like to add another name... 'Osama Bin Laden' (who was 'executed' yesterday by US commandos). 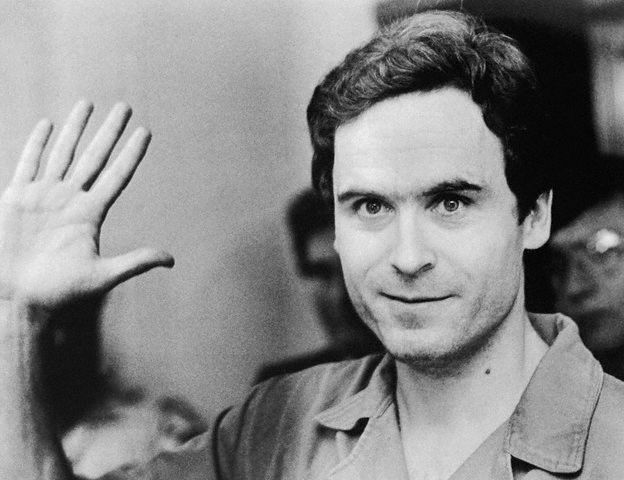 "Psycho Killer... qu'est ce que c'est?" Nice song. Brings back memories. If only they were called "The Talking Hands"
Sari, thanks for that illuminating description! Of course, I myself have one of the most fully formed girdles I have ever seen. And I have seen broken headlines in the hands of schizophrenics, as well as in "normal" individuals. So it is a question of a combination of signs. I would really like to do a study looking at different combinations of signs and their correlation to mental illness. Sari wrote: The low set fingers only indicate mild cases such as shyness etc.. not a sign of pshycopaths, well not alone as an indicator anyway. Iva Marlat was named the Prison demon, and he had a well formed girdle of Venus, a very broken up short head line, sectioned into three pieces. His thumb tip was slightly boulbous but his index tip was more pointy than rest of fingers. He had a longer tip on mercury finger than the middle and lower part of it and skin was quite coarse looking. Overall at first glance it was the head line which stood out as different. So as you can see there is many indicators that have to come into play, these are just a few that I remember from my study of his hands, unfortunately I lost my notes in a fire so cannot refer to them. cshahar wrote: ... So it is a question of a combination of signs. I would really like to do a study looking at different combinations of signs and their correlation to mental illness. 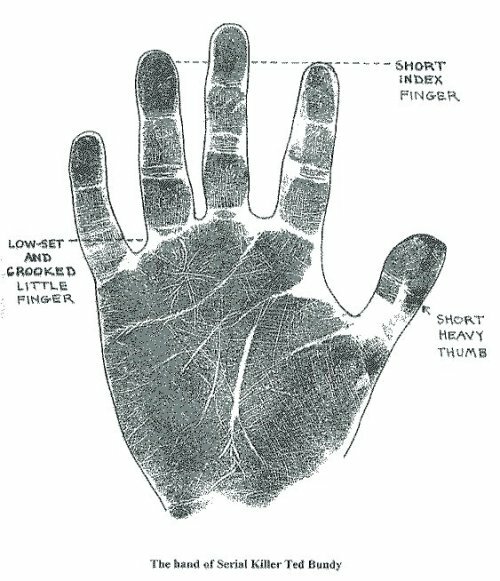 - http://www.handresearch.com/diagnostics/schizophrenia-simian-line-palm-reading.htm (a first impression how schizophrenia can manifest in many 'perspectives' of the hand). I am looking forward to hear your thoughts! 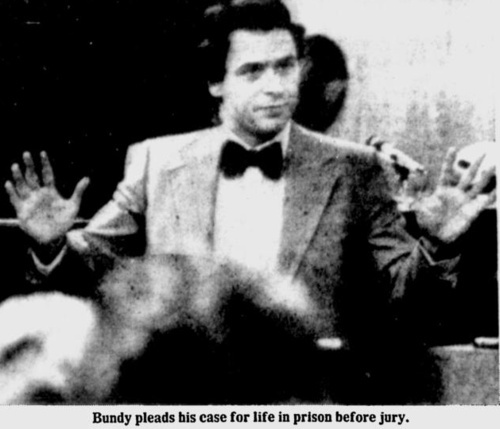 The hand of Ted Bundy, who was a classic psychopath who appeared to be an upstanding citizen but actually killed over 30 women in the 1970s (who appeared to have had a combination of an anti-social personality disorder + an obsessive compulsive personality disorder). I would like to add that Dr. Holtzman made a thorough research in the Israeli Jail "Mawasiahu" and found that the feature common to cruel criminals was a C shaped little finger usually with a hard hand. He later found that this feature was also common to nurses who worked with very difficult cases therefore "Mother Theresa's". In his book he calls this feature "fragmentation" and says it is common to "saints" and criminals. He also gives a full theoretical etiology explaining the source of this behavior. Thank you for your input, and I am very pleased to see you participating in this forum! It's difficult to make out the lines on his hands, however using Chinese face reading his face reveals a great deal. Eyebrows are of the Wood element and the challange is anger. The left side of the face is the private, concealed part of a person and the right side is what is presented to the outside world. His left eyebrow is much thicker than the right indicating a great deal of concealed anger. Also, note that the right side of his mouth is smiling. The left is not. He carefully crafted what he wished the outer world to see. Cover each half of his face and you'll see him clearly. That's interesting about the differences in his eyebrow thickness showing concealed anger. I'll have to watch for that in people. I tend to be uncomfortable around people where I can see the roundness of the bottom of the iris, or see the whites underneath. At a glance he's pleasant to look upon, but when you look closer you can see he's not a balanced individual. I often will move my browser window so that I can only see half of a face. Sometimes even getting a mirror to reflect back the half face into a whole and study the two very different faces. You are spot on in your sense of discomfort around a person with the whites of the eyes showing beneath the iris. The Japanese call this condition sanpaku. It denotes a physical and spiritual imbalance. White showing below the iris indicates a yin condition and white showing above says that the person has become too yang. And if you see anyone with white showing completely around the iris, head for the door. This can denote violence. I wonder if this was the reason the American Indians said do not trust the white eyes, they talk with fork tongue. Thanks for sharing that Roberta! Good advice!! jeanette wrote: I wonder if this was the reason the American Indians said do not trust the white eyes, they talk with fork tongue. I hadn't heard "white eyes" before, but I think it's white man rather than eyes. In the films they say white eyes. I have heard the saying "don't shoot until you see the whites of their eyes", but I think that might be a civil war quote. I have heard that saying and, although I don't really know, I think it might ,mean they are paralysed with fear and ripe for shooting. I'll give this explanation of yin and yang my best shot in as short a space as possible. The theory of yin/yang is the principle behind Oriental medicine. Everything in the Universe exists in a state of change. Things are relative and not absolute. Without cold there would be no hot, without up there would be no down. Everything changes. There is no such thing as a one-sided coin. When there is dispersion, cold, moving outward, lightness, slower speed, that is yin. Thanks very much Roberta. That does give me a good idea about it. Do you have hot and cold, expansion and contraction reversed?